Building new homes and modernizing existing ones can be expensive. Project budgets are sometimes exceeded with unexpected surprises and elaborate aspirations; upgrades with crown mouldings, hardwood floors, cabinetry, and countertops all increase costs to the project. Modern engineering and construction projects are growing ever more ambitious and complex. Technology plays an integral part in helping the industry to achieve such goals, enabling enhanced design, planning, and construction. With New York City’s One World Trade Center taking the top prize in the Americas, the Council on Tall Buildings and Urban Habitat (CTBUH) released the winners of its Best Tall Building Awards, highlighting the best new skyscrapers and super-tall structures. A panel of judges examined 123 entries from four competing regions: the Americas, Asia/Australia, Europe, and Middle East/Africa. The awards aspire to provide a comprehensive view on these important buildings while advocating improvements in every aspect of performance. The winners showed a commitment to sustainability with some exemplifying progress in the use of greenery both to enhance the comfort of occupants and reduce environmental impact. Others showed a dramatic sculptural form and urban presence. As mentioned, One World Trade Center won the Americas category. Built on the World Trade Center site, the building’s design acknowledges the adjacent memorial. It has a strong symbolic importance to both the city and country. The classic New York skyscraper design exceeded all expectations. Winning the Asia/Australia category was CapitaGreen in Singapore. The green living vegetation covers 53 per cent of the perimeter of the façade and is placed within the double-skin. This offers a potential for solar shade, agricultural output, and environmental and psychological benefits. 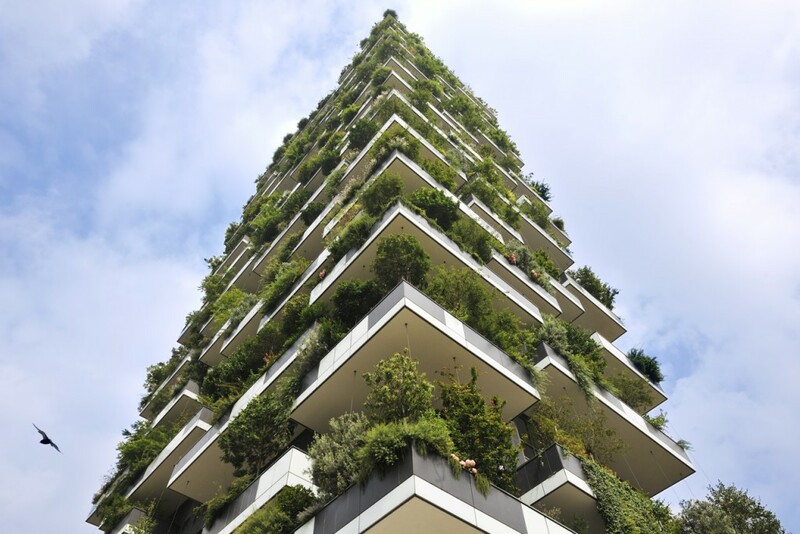 Bosco Verticale (Milan, Italy) took the Europe category for its intensive living façade, which incorporates numerous trees and more than 90 species of vegetation. The building is an active interface to its surrounding environment and the plants act as an extension of the tower’s exterior envelope. In the Middle East/Africa category, the award went to the Burj Mohammed Bin Rashid tower in Abu Dhabi, United Arab Emirates (UAE). The tower blends into its cultural and geographical context both through its design and its use. An undulating cladding creates a mirage effect, which eludes a desert ambiance. The building also includes a marketplace selling a variety of products from luxury goods to artisanal crafts, which helps integrate it to its surrounding. For more information on the winners and to see a list of finalists, click here.